FULTON, NY – The Fulton community Good Friday Cross Walk will be held on April 3. It will begin at 10:30 a.m. in the parking lot of Holy Trinity Parish, 309 Buffalo St. Participants take part in a previous Cross Walk. 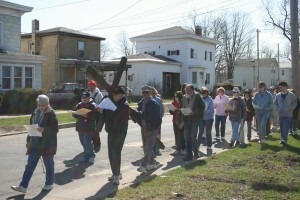 Walkers will take turns carrying a large wooden cross in the downtown section of the city of Fulton. A total of 10 stations of the cross will be observed. Each station will include scripture, prayer and the singing of a hymn. This walk returns to and remembers the way of the cross that our Lord traveled on his journey to the place of His crucifixion. The Cross Walk will conclude about noon at First United Church of Fulton, 33 S. Third St.
Everyone who has taken part in the walk and has provided assistance to walkers will be invited to a soup and bread lunch provided by the board of deacons of First United Church. There is no cost for the lunch. It is made up of those member congregations that support ecumenical programs that include the annual Michaud Memorial Service and the annual CROP Walk which raises funds for world hunger and also for local food pantries.